Home Food & Cooking Healthy Eating Is It Really Better to Opt for “Fat-Free” Options? If you’re trying to stay slim, prevent heart disease or keep your cholesterol levels down, you probably opt for “fat-free” options. And it’s understandable why. For decades, we’ve been told that fat, especially saturated fats, will cause heart disease, weight gain and lots of other health problems. But that’s not true, and the research is emerging to prove it. What’s more, fat-free processed foods are definitely not as good as the media make them out to be. In fact, they can actually make your health worse, not better. Back in the 1960s, researchers, including one by the name of Ancel Keys, did a study that observed people in seven different countries, along with their diet and rates of coronary heart disease. At the conclusion of the study, Keys and fellow researchers said that it was dietary fat, particularly saturated fats, that cause heart disease. And for decades, we all believed this, eschewing healthy animal fats, like butter, fatty red meats, and eggs. In their stead, we filled up on margarine, industrially-processed seed oils, and “low-fat” or “fat-free” foods. In 2016, something happened that would change the world of both health and nutrition. Research published in the journal, JAMA Internal Medicine, revealed that Keys and his fellow researchers left out significant data and actually falsified the study results. When researchers from the University of California, San Francisco, examined the original study papers, they learned that the actual conclusion of the study was that dietary sugars were actually the real culprits when it came to coronary heart disease – not dietary fat. So, the question is, why in the world would researchers, like Keys, lie so blatantly, and lead millions of people astray for the next 50 years? The simple answer? They were paid to do so. The sugar industry paid Harvard researchers $50,000 to make fat the big, bad guy, and sugar the good guy. It worked. Healthy, animal fats, when part of a balanced diet, do not cause heart problems. But what about dietary fat and weight gain? Do low-fat diets help you lose weight? Because fat has been demonized for decades, doctors, dietitians, and health experts have continued to recommend a low-fat diet. That is, 10 to 15 percent of your overall daily calories come from fat. Apart from being promoted as a heart-healthy diet, low-fat diets were sold as a surefire way to lose weight. The reasoning behind this was the fact that one gram of fat contains about 9 calories, while one gram of protein or one gram of carbohydrates contains about 4 calories each. So, people believed that if you consumed fewer overall calories, you would lose weight. This would be true if the outdated belief of “calories-in-calories-out” was true. But it’s not. We now know that not all calories are equal and they do different things in the body. Secondly, research shows that low-fat diets are not as effective at helping people lose weight compared to low-carb, high-fat diets, like the ketogenic diet. One of the reasons why this may be is because even if you’re consuming fewer fat calories on a low-fat diet, you consume a ton of carbohydrates calories. And when the diet is high in carbs, the hormone insulin stays high. And as long as insulin is high, it is much more difficult for the body to lose weight. On top of this, any excess carbohydrates you consume but do not use for energy, get stored as fat in the body. Therefore, it is dietary carbohydrates and sugars, not healthy, dietary fats, that increase the risk for overweight and obesity. 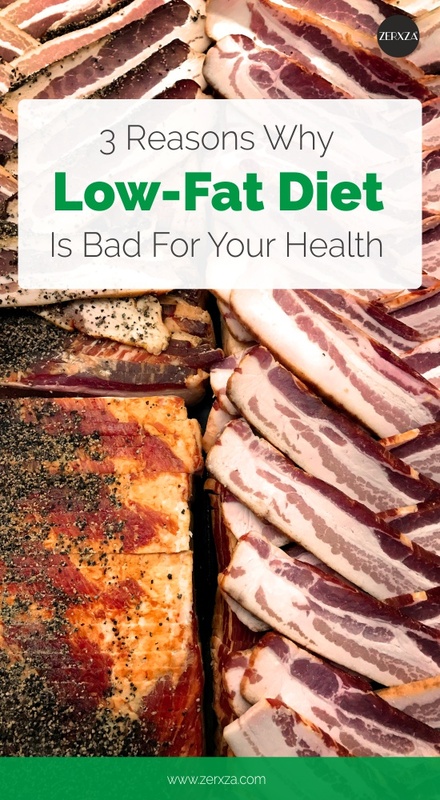 Are low-fat diets bad for you? The verdict is out, and the answer is: Yes. Low-fat diets might still be popular, and fat-free options might fill every grocery store aisle, but there are several reasons why you might not want to put them in your cart. A major study published in the prestigious journal, The Lancet, observed 135,000 adults and found that those who followed a low-fat diet had a 23 percent increase in early death compared to those who ate a higher fat diet. Low-fat or fat-free foods don’t have much – if any – fat. So, what do they have a lot of? Carbohydrates. And the vast majority of processed, fat-free foods are loaded with carbohydrates. By swapping healthy fats for processed carbs, the U.S. has seen a massive increase in overweightness, obesity, type 2 diabetes, and other chronic diseases. In fact, researchers go so far as to call this an epidemic. Your body needs fat-soluble vitamins, like A, D, E and K. But when the fat is removed from food, your body is robbed of essential, life-building nutrients. Remember, fat and cholesterol help your body absorb vitamins, they help to build cellular membranes and they also nourish the brain, the central nervous system, and the endocrine (hormonal) system. Without healthy dietary fats (butter, ghee, lard, eggs, olive oil, coconut oil, avocado oil, fatty fish) and the nutrients they provide, the body suffers. Let’s make one thing clear though! Not all dietary fats are made equal. While it’s important to eat fats without fear, you do need to avoid trans fats, and industrially processed seed and legume oils, like canola (rapeseed), soy, peanut, corn, safflower, sunflower, etc. These are very inflammatory in the body and they will cause damage. Low-fat spreads, like margarine, low-fat mayonnaise, etc. The takeaway? Processed, fat-free options are just not very healthy for you. They tend to increase how many carbohydrates you eat, and with that, the risk for chronic disease, weight gain, and even obesity. Previous articleIs Being a Hopeless Romantic a Bad Thing?